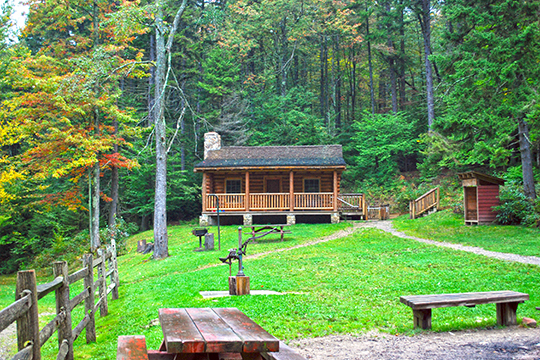 Photo: Main cabin (reconstructed) at Middle Mountain Cabins in Monongahela National Forest. Listed on the National Register of Historic Places in 1990. Photographed by User:Brian M. Powell (own work), 2008, [cc-by-3.0 (creativecommons.org/licenses/by/3.0)], via Wikimedia Commons, accessed January, 2013. The Randolph County Courthouse is located at 2 Randolph Avenue, Elkins, WV 26241; phone: 304-636-1045. The first permanent settlement in the county was in 1772. The town of Beverly was chartered in 1790 and served as the county seat for the first century. Randolph County developed very slowly due to its topography and the county remained primarily agricultural well into the late 19th century. Some attempts were made to open up the county through road development but the topography made construction difficult and the climate precluded use of the roads except in fair weather. The first turnpike through the county was the Staunton & Parkersburg Turnpike which was begun in the 1830's and not completed until the early 1850's. The Beverly & Fairmont Turnpike followed in 1850 and then the Pennsylvania, Beverly, & Morgantown Turnpike was constructed about 1853. Michael Gioulis, Historic Preservation Consultant, Downtown Elkins Historic District, Randolph County, WV, nomination document, 1995, National Park Service, National Register of Historic Places, Washington, D.C.